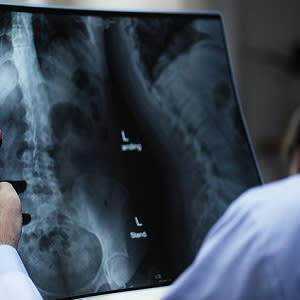 University of Surrey researchers have developed a new flexible x-ray detector that they claim can achieve high sensitivity levels that strongly compete with current technologies. The researchers also proved that it is possible to create a device that conforms to the subject – i.e., it could be possible for breast cancer screenings to be carried out by adapting the x-ray detector arrays to the specification of different patients. This functionality is not available with current x-ray detectors. Detectors that are presently used for mammograms and for dose measurements in radiotherapy are often rigid, resulting in screening errors, or dose delivery to surrounding healthy tissue. This has raised concerns of additional tissue damage or the growth of secondary tumours. While flexible x-ray films such as those used in dentistry or chest x-rays bypass this issue, they are not able to achieve real-time imaging. The new x-ray detector was developed by researchers from Surrey's Advanced Technology Institute (ATI) who embedded oxide nanoparticles in a bulk organic structure that allows for large area detectors to be produced inexpensively, according to a study published in the journal Nature Communications. This means the device can be used for high-speed monitoring of people and vehicles over large geographical areas, which is important in border security. "Our new technology has the potential to transform many industries that rely on x-ray detectors. We believe that this innovation could help save lives, and keep our borders more secure, and make sure that the food we eat is as safe as it could possibly be," says the study lead author Hashini Thirimanne, a PhD student at the University of Surrey. The detectors created by ATI researchers are able to achieve high sensitivity levels, while still operating at low voltages, as well as over the whole x-ray energy range spectrum. A new start-up company to further develop this technology and bring it to market – looking specifically at the health, food monitoring and pharmaceuticals sectors – has been formed. Dr. Imalka Jayawardena, co-author of the study at the University of Surrey, stated: "We are excited to pursue this technology further and bring it to market. I would like to thank the University of Surrey for their support over the years and I look forward to continuing this relationship." Professor Ravi Silva, Director of ATI, and corresponding author said the research team is grateful to the Leverhulme Trust for funding this work via a major research programme. "We are incredibly proud of the young researchers at ATI who have progressed this project and have produced technology that could very well save lives and make the world safer," Prof. Silva added.